Years and years of hard work by our seniors in the BGSUGD program will be on display for your viewing pleasure. Join us in the lobby of BGSU’s Wolfe Center for the Arts to enjoy an orchestrated night filled with thesis work, portfolio viewings and all the light refreshments you could ever hope to sample. Remarks and an awards ceremony will begin at 6 p.m. Our juror, Connie Ozan of Twist Creative will be selecting the awards for Best Typography as well as Best Overall Portfolio. The Graphic Design Faculty will award the Overall Best Thesis. 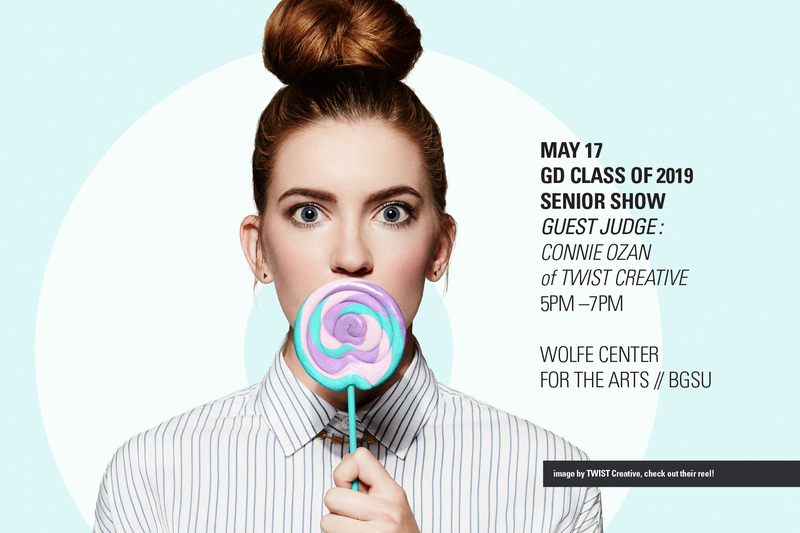 Connie Ozan is the founder and design director at Twist Creative in Cleveland. She is a designer and visual thinker at heart. Her passion for design has led to many areas of interest, which include a love for branding, advertising, interior design and styling. At Twist, her role is overseeing design aesthetic for clients and the agency. Her team of Fearless Thinkers strive to fight mediocrity, while focusing on design that is thoughtful and result driven for our clients. Her specialties: Branding, Identity Design, Campaign Development, Corporate Communications, Event Planning, Graphic Design, Interior Design, Styling, Color and Fashion Enthusiast.